Cross Connections: "Keep some souvenirs of your past, or how will you ever prove it wasn't all a dream?" "Keep some souvenirs of your past, or how will you ever prove it wasn't all a dream?" I have been researching my family tree for over 30 years. I've always loved history. In fact, I have a degree in it. I grew up going to family reunions. My paternal grandfather, George Cross, was one of 9 children and all his siblings but one were within a 20 mile radius, so those family gatherings were rather large. Family and family stories have been a part of me for as long as I can remember. But it was the birth of my only child, a daughter, in May of 1981, that was the catalyst to really start me on my journey into the past. The photo up in the right had corner is one I grew up looking at in my grandfather's photo album every time we would visit. They only lived a little over a mile from us, so we visited a lot, and I looked at that picture a lot. In the back on the left is his father, my great grandfather, Henry A. Cross. He died 2 years before I was born. Oh how I wish I could have known him. I have that same longing to know all of my ancestors! Come along with me as I journey back and let me introduce you to some of the most interesting people I have ever "met." Here's one of the most important of those interesting people, my father, John Stanley Cross. This picture was taken a year or so before I was born. Daddy was born in 1930. But wait, we'll save more of his story for another post. You are off to a great start! Congrats! Thank you so much for stopping by and for the encouragement. This is wonderful! I look forward to learning more about my past. Love you! Thank you so much for checking it out. Love you little sister!!! Thank you for your encouragement. I appreciate it! Caroline, I consider that high praise! Thank you so much!!! I found your blog via the Facebook Group "Technology for Genealogy." It looks great! I'm a fairly new genealogy blogger myself (almost 5 months now). Welcome to the genealogy blogging community! Oh, and the photo of your dad is really fun! 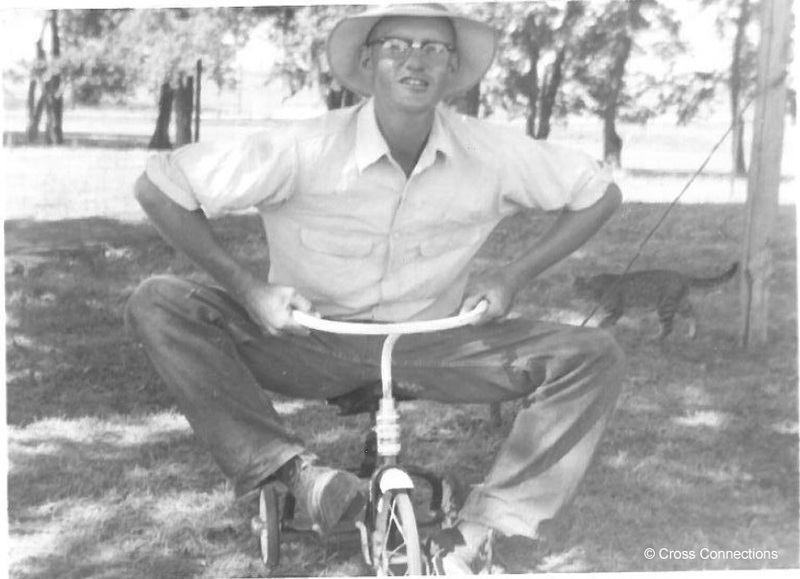 My father and mother still have the tricycle! I have treasured that article your wrote! Thank you so much for doing it. I had no idea you were tracing your family tree too. I think maybe reading snippets of info presented in a blog is much more interesting to our families. I hope so anyway!